In May of 1951, a group of immigrants from eastern Europe celebrated the birth of St. Nicholas (the Wonder Worker) of Myra. Led by a priest who had fled from Russian Communism, this handful of Eastern Orthodox Christians held their first Divine Liturgy on St. Nicholas Day in a room at the back of a real estate building in Saratoga, California. The church, hall, and rectory were built within the next decade and have served the parish since then. Our parish’s first priest, the Very Reverend Michael Zelneronok, was born in Latvia. He was ordained a priest in 1936 and served in Riga and Liepaja until 1940 when the Russian army overran the country. He taught Russian and religion until the Germans overran Latvia in 1941. For the next six years, Father Michael ministered to Christians in camps throughout Germany. Father Michael was among many immigrants who had been displaced during the war, interned in labor camps throughout Germany, and then fled to America to escape Russian Communism. He came to Saratoga, moved into Villa Montalvo, and became its gardener. He soon became acquainted with a group that had similarly escaped Communist Russia and settled in Saratoga. The parish was officially founded in May 1951, when about six families celebrated St. Nicholas Day. Regular services were soon announced to the public to be held at the Russian Orthodox Greek Catholic Church with Father Michael as officiating priest. The services were held in the rear of the building that housed the Harless Moser Real Estate Agency on Saratoga-Los Gatos Road. By December 1952, a lot was purchased by the parish to house a new church at its present location. That December, after the Divine Liturgy was held for St. Nicholas, the church’s patron saint, the women of the church held a tea for the local community. In 1954, a day-long event was held in July to raise finds for the erection of two badly-needed Russian Orthodox churches in the area: St. Nicholas Russian Orthodox Church and the Nativity of the Holy Virgin Russian Orthodox Church in Palo Alto. The benefit consisted of a picnic and Russian-style food, Russian ballet, social dancing, a concert of vocal, piano, and violin music, as well as a bazaar. This was held at Villa Montalvo. Princess Natasha Romanov served as chairman and coordinator of the event. By August 1954, ground had been broken, the site consecrated in accordance with the sacred rites of the Eastern Orthodox Church, and contractors had begun erecting the church in Saratoga. By September 1954, Father Michael had over 100 members, all of whom were primarily European immigrants. That same year, on St. Nicholas Day, December 19, Bishop John Shahovsky of San Francisco presided over the dedication ceremonies of the temple. The cost of building the church was about $5,500. A second Russian Orthodox Church picnic was held in July 1955 at Villa Montalvo sponsored by three parishes: St. Nicholas Orthodox Church, Holy Trinity Cathedral of San Francisco, and the Nativity of Holy Virgin Church, by now located in Menlo Park. By this time, a sisterhood had formed at St. Nicholas. The sisterhood was largely responsible for the Russian-style events at the picnic and concert. The first bazaar at St. Nicholas Orthodox Church was held on December 10, 1955, with proceeds going toward the completion of the church’s social hall. The hall was officially dedicated on St. Nicholas Day on May 27, 1956. Again, Bishop John of San Francisco participated. This day also commemorated the fifth anniversary of the founding of the church. His Eminence, the Most Reverend Leonty, Metropolitan of the Russian Orthodox Church in North America, visited St. Nicholas Orthodox Church in July 1957 and again in August 1959. In August of 1959, a zoning change was approved to allow the church to build a rectory/school building. Ground was broken in February of 1960 for the rectory and dedicated on July 27, 1960, at a cost of $8,000. On September 17, 1961, St. Nicholas Orthodox Church celebrated Father Michael’s 25th anniversary of his ordination. In November 1962, a dedication of the new church vestibule was held. The original church had no vestibule, but through diligent appealing, Father Michael convinced the city of Saratoga to waive a required 25-foot setback from the road. The newest part of the church added a bell tower as well, giving the church its Byzantine (or Russian) appearance. This last addition gave the church a shape and profile that has lasted until today. Bishop John of Chicago presided over the vestibule dedication. By this time, the church had completed the buildings currently present. The sisterhood held an annual bazaar or St. Nicholas Tea. The bazaar took on several names over the years, among them Russe Bazaar and Russian Festival. Special visits continued over the years. His Eminence, the Most Reverend Ireney, Archbishop of New York and Metropolitan of All America and Canada, visited St. Nicholas Orthodox Church in 1966. In December 1966, the miraculous Icon of the Virgin Mary of Tihvin was brought to the church. Tradition holds that this icon was painted by St. Luke; it is claimed to be the oldest icon in Europe. Father Michael continued to serve at St. Nicholas until 1971, when he was reassigned to the St. Nicholas Orthodox Church in San Diego. When he left Saratoga, he had baptized 91 people (60 from Orthodox families and 31 converts), had 51 children enrolled in Sunday School and the church attendance was 60-70 members in the summer and 100-150 in the winter. Later, in July 1976, Father Michael was elevated to the rank of Mitered Archpriest. He retired on August 30, 1987, moved to Crystal River, Florida. He lived there until he feel asleep in the Lord, on September 8, 2003. Father George Benigsen served at St. Nicholas Orthodox Church from 1970 to 1979. Father Benigson also taught at the Defense Language Institute in Monterey, California. Because of this, he was able to bring many new converts into the church. He had the current iconostas made and introduced English into the church services. He fell asleep in the Lord many years ago. His wife, Matushka had also made heavy contributions to in the church bringing in English music and well remembered as choir director. She fell asleep in the Lord in July 2004. Father John Newcomb served at St. Nicholas from October 1979 to June 1980. A newly ordained priest when he came to St. Nicholas Church, he went on to become Abbott Anastassy and is now Archimandrite Anastassy. He served at the old Holy Virgin Cathedral in San Francisco for many years until falling asleep in the Lord in 2004. 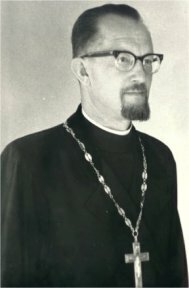 Father Jonathan Mayo served at St. Nicholas Church from October 1979 to January 1983. Father Basil Rhodes came to St Nicholas Church in January 1983 with Matushka Joanna. In 1985, they adopted Maria. In early 1987, they adopted her brother John. Both children continue to serve faithfully in the church. Over two decades, Father Basil has led St. Nicholas Church through hard times and good times sharing his wisdom, knowledge, and loving heart, helping us to become better Christians and better people.